Heat oven to 400 degrees. Using a peeler, peel the skin off of the butternut squash (remember to also peel the green strips). Then cut into 1″ cubes. In a large bowl, toss the butternut squash cubes with the red onion, 2 garlic cloves, rosemary, thyme, parsley, 1-2 tablespoons olive oil, 1 teaspoon salt and fresh ground pepper (to taste). Spread butternut squash/red onion mixture onto a large baking sheet that has been greased or sprayed with cooking spray. Bake in the heated oven 20-25 minutes until tender; toss occasionally. Place pine nuts on a small baking sheet. 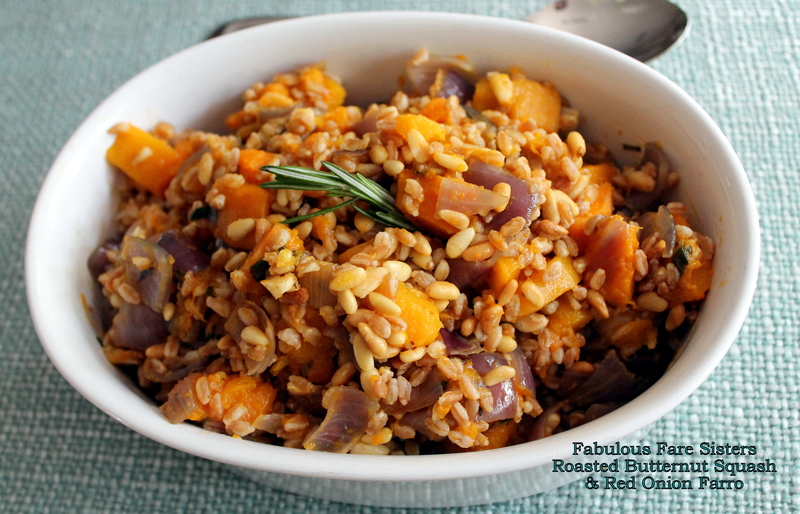 When butternut squash is tender, remove from oven, and place pine nuts in heated oven to toast for one minute. Remove and set aside. Meanwhile, heat one tablespoon olive oil in a sauce pan. Add remaining garlic and sauté one minute. Add the farro and sauté another minute. Add 2 1/4 cups water and 1/2 teaspoon salt. Bring to a boil; reduce heat and cook 15 minutes until farro is tender. Drain. 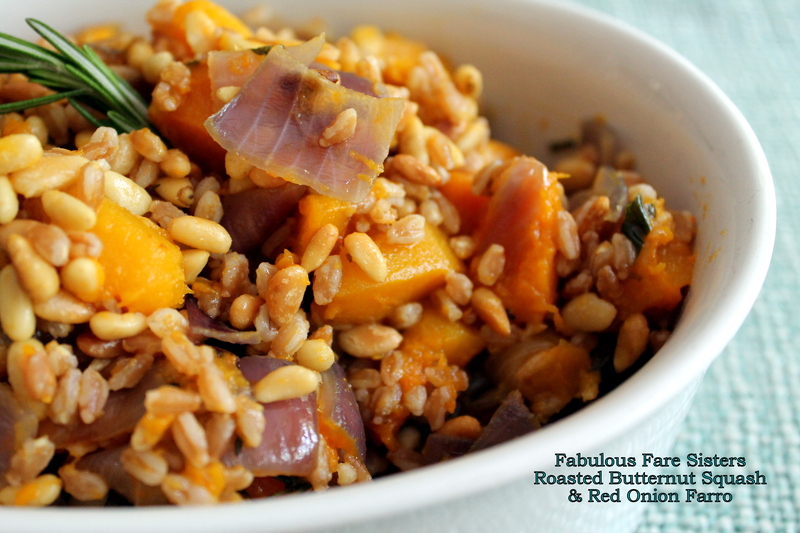 In a large bowl, combine the drained Farro, the roasted butternut squash & red onion and the toasted pine nuts. You can use this as an accompaniment to your main entree or by itself. It’s hearty enough to serve alone. I actually will serve myself a big bowl of this for lunch. Looks flavorful and tasty! Great recipe, Linda! Healthy vegetarian dish! Looks tasty too. That looks really good. Of all the things we raise in our garden, squash is my absolute favorite. I’ll have to try this recipe soon. We just love faro and I love having another recipe for it! I made it! It was delicious. I’ve tried this and it was delicious and very satisfying, thank you! !